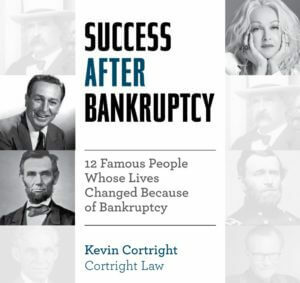 Temecula Bankruptcy Attorney Kevin Cortright recently published his new eBook titled “Success After Bankruptcy”. The books details Twelve famous people whose lives changed because of Bankruptcy. Some of the famous people that have filed Bankruptcy and come out better than before on the other side aren’t who you might think. These Twelve people include Abraham Lincoln, Burt Reynolds, Cyndi Lauper, Henry John Heinz, P.T. Barnum, Larry King, Henry Ford, George McGovern, Dionne Warwick, Mark Twain, Walt Disney, and Ulysses S. Grant. Mr. Cortright has released his new eBook for free to those that are struggling with the choice of filing Bankruptcy and worried about how it might change the course of their lives. Since many people find themselves at some point in their lives drowning in debt and looking for a way to get back on even ground, it is important for them to know that there are viable options to start completely fresh. Filing Bankruptcy can stop creditor phone calls, wage garnishments, bank levies, car repossessions, home foreclosures, law suits, IRS issues, and restore financial peace of mind. Kevin Cortright’s new book aims to teach those that Bankruptcy is sometimes simply just one stepping stone in a much, much longer life journey and that people can shift their thinking to use Bankruptcy as a catalyst rather than a crisis. Those that are interested in learning how to empower themselves through the Bankruptcy process can read Mr. Cortright’s new eBook for free!